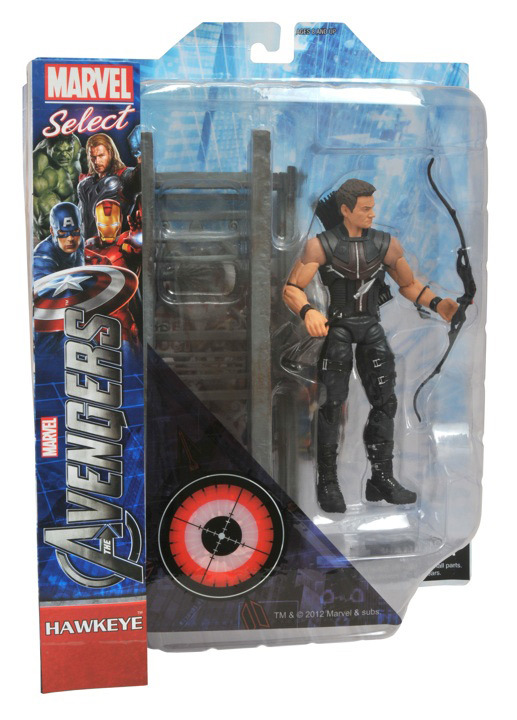 In Stores This Week: Marvel Select Avengers Movie Hawkeye! June 26, 2012 - Diamond Select Toys has hit the bullseye once again! The newest Avengers movie-based Marvel Select figure lands in comic shops and specialty stores this week, and it's Clint Barton, a.k.a. the arrow-slinging Hawkeye! Standing nearly 7 inches tall, Clint comes poised for action in his display-ready packaging, with a portrait of the archer on one side. Accessories include his bow, arrows and a detailed section of the Pershing Square Overpass from the climactic New York City battle! His section connects with that of the Chitauri Footsoldier (coming soon!) to form a larger battle scene! Also arriving in stores: re-issues of four other classic Marvel Select figures: Cyclops, Thing, Magneto and the Abomination! If you missed out on them the first time, now's your chance! June 20, 2012 - The Avengers continue to assemble! Following up on the popular Avengers Movie Hulk Marvel Select figure comes the Avengers Movie Iron Man, hitting comic book shops everywhere today! Shown in his Mark VI armor, this figure was originally released as part of Diamond Select Toys' Marvel Select series for Iron Man 2, but it has long been sold out. 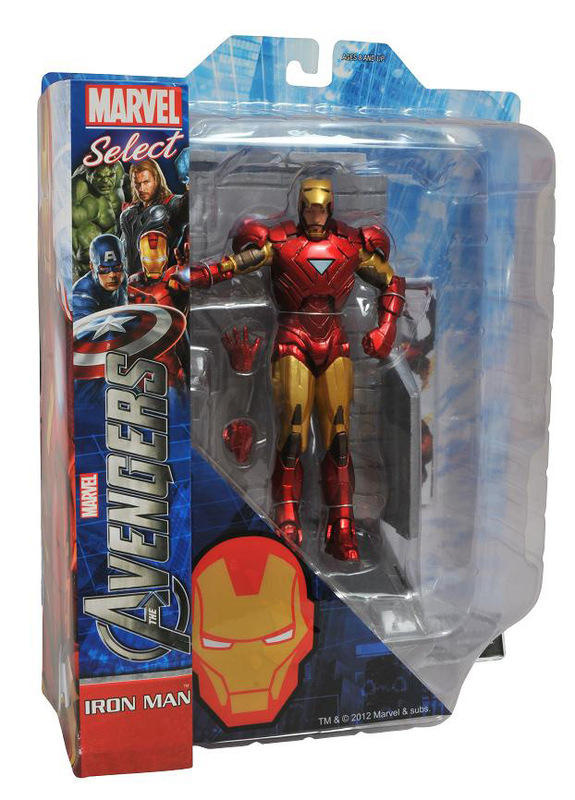 Now DST has brought him back in all-new Avengers-themed packaging, complete with display base and removable faceplate! He's only available at comic book shops and other specialty toy retailers, so pick him up before he disappears again! Check out in-package pictures below, and call your local comic shop to reserve your figure! May 9, 2012 - It's new comic day at comic book stores nationwide, and for many stores that means it's also new toy day! With Marvel's The Avengers movie still smashing box office records, Diamond Select Toys thought this was the perfect time to roll out their Avengers movie product to comic book shops. The 45th series of Marvel Minimates (designed by the folks at Art Asylum) hits stores this week with four two-packs: Iron Man and Hulk, Captain America and Thor, and the specialty store-exclusive Chitauri Footsoldier and SHIELD agent Maria Hill, with a rare variant set featuring the Chitauri General! And if you need something bigger than two inches tall, check out the Marvel Select Avengers Movie Hulk action figure. At well over 9 inches tall and with 16 points of articulation, this massive, specialty-store-exclusive figure (designed by Gentle Giant from the movie's digital data), will fit in with any Avengers movie toy collection. BENTONVILLE, Ark., April 26, 2012 -- Fans of Marvel's The Avengers, prepare for game play! Beginning today, in advance of the film release of Marvel's The Avengers on May 4, only Walmart customers will have access to the Super Hero Augmented Reality (AR) game featuring their favorite Avengers, including Iron Man, Thor, Captain America, The Hulk, Hawkeye and Black Widow. This new "Super Hero AR" app is available now for download at the iTunes App Store and Android Market. Once downloaded, customers have instant access to Hawkeye, and only from the aisles of their local Walmart stores, customers can then "unlock" the superpowers of the five remaining Avengers and ultimately save the world. Hillside, N.J. & Cary, N.C. - April 26, 2012 - Wizkids/N.E.C.A., the makers of HeroClix Online today announced the arrival of the game's latest Marvel collection, Marvel's The Avengers, which adds 16 new figures to the online game and are also available through codes in physical sets. 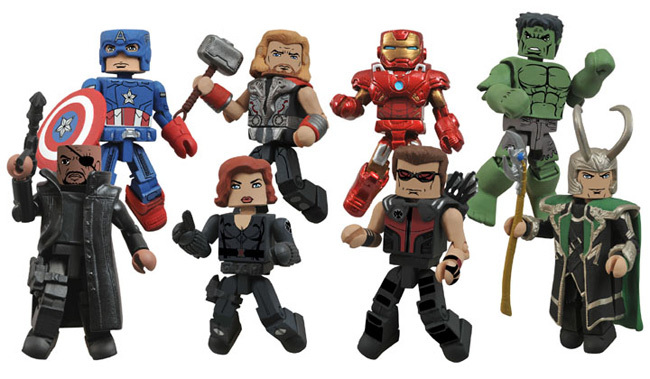 Joining the current line-up of Marvel characters, Marvel's The Avengers Starter Pack figures include Thor, Captain America, Iron Man, Black Widow, Hawkeye and Hulk. 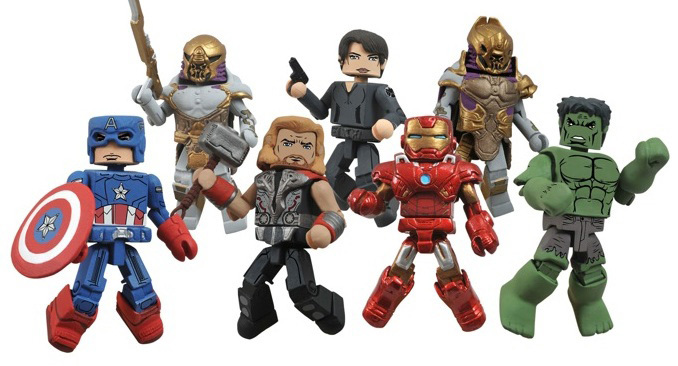 Thor, Hulk, Nick Fury, Captain America, Iron Man, Agent Coulson, Skrull Infiltrator, Hawkeye, Tony Stark and Heimdall are also available as Single-Figure Boosters. Offering players an alternative way to collect, free codes for the virtual Marvel's The Avengers Starter Pack can be found in physical Marvel's The Avengers HeroClix Starter Packs. Additionally, codes for individual, random, virtual Gravity Feed Singles can be obtained through physical Gravity Feed Single-Figure Foil Packs or Booster sets. April 2012 - Marvel's The Avengers movie is on the way, and so are the Avengers movie action figures from Diamond Select Toys! DST's new, movie-based Marvel Select figures are currently en route from the factory, but they couldn't wait to do an Avengers giveaway, so they thought they'd give away some awesome comic-based Avengers instead! One randomly selected fan will get Marvel Select figures of Iron Man, Spider-Woman and the four Disney Store-exclusive Avengers: Thor, Captain America, Hawkeye and the Black Widow! 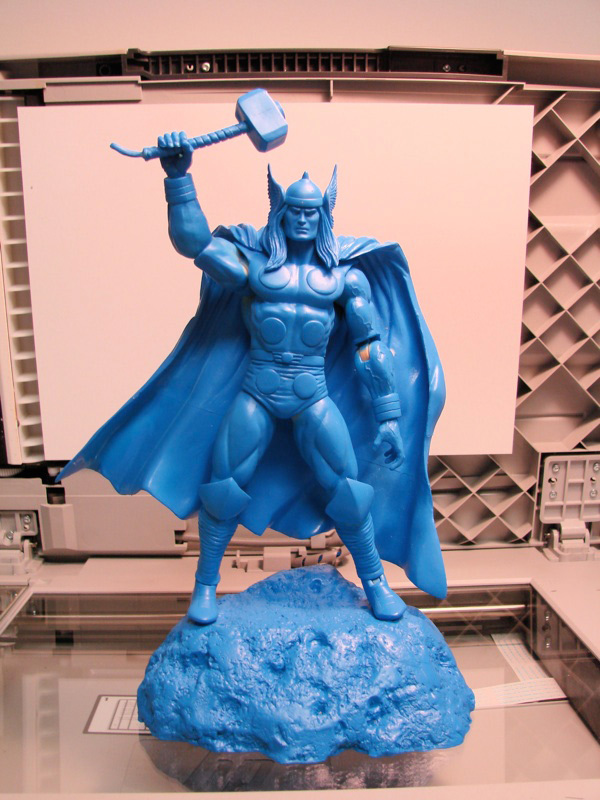 Plus, the lucky fan will get a solid blue prototype version of Thor, straight from the factory floor! April 2012 - Huge thanks to Albert Brocca for letting us know about this neat stop motion film - it is the Avengers movie trailer, made using Marvel Legends action figures!